Unleash your spooktacular creativity and get a chance to win an Overnight Stay at a Premier Room of View Park Hotel, inclusive of breakfast for two (2). 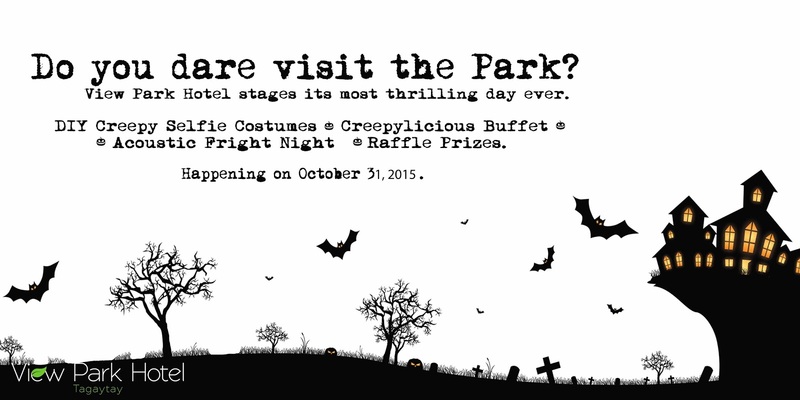 Simply take a selfie together with your favorite Creep (any of the View Park Hotel staff wearing a costume), Wear your own DIY Creepy Costume and share your photos by posting it on your Facebook timelines. Tag or post at www.facebook.com/viewparkhoteltagaytay. Winners will be raffled online through electronic raffle draw. Your favorite Creep will also have a chance to win prizes on most number of likes wins! Halloween props will be posted in front of the Red Lemon Grill area. Winners will be announced a week after the Halloween party: sumptuous buffet dinner will be served. There will also be an Acoustic Fright Night where you will have the chance to sing and dance your heart out. Raffle prizes and other unexpected surprises are at stake. Dare visit View Park Hotel on October 31, 2015.